Our unique partnership with HP offers educational prices for students at Cecil Hills High School. 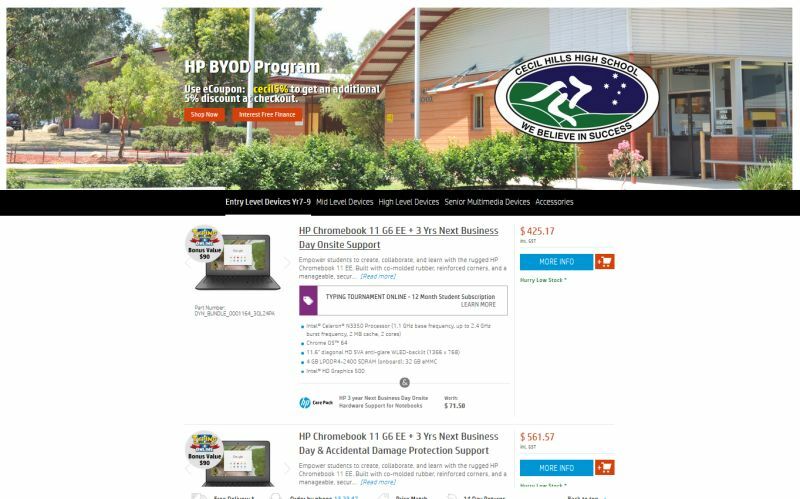 Please visit the link below to make secure purchases from our HP Portal and have the device delivered straight to your home. Buying a device from the portal offers on-site warranty repairs. A HP technician will come to the school and have the device repaired promptly. There are various extended warranty add-ons to purchase through the portal so please read carefully and understand what it covers. All students in Year 7-12 are required to bring an approved, supported and charged learning device to school each and every day. Our Bring Your Own Device policy does not allow mobile phones as learning devices. Mobile phones must be off and out of sight in classrooms. We are a preferred WINDOWS based school - it is preferable for the BYOD device to be a windows laptop. A significant amount of online learning occurs via our electronic Moodle platform and it is important for students to have a learning device for this reason. Just as in the past, schools expect students to bring a book and pencil case, the demands of the 21st century has added new technology to our 'pencil case'. Purchasing a new device? As a product and price guide, Harvey Norman at Liverpool has provided information and special prices to families of students at Cecil Hills High School - see below to download our unique flyer from Harvey Norman for more information. As a guide, the first device is a basic package suitable for junior high school students; the second device is an intermediate package; and the last package is an advanced package suitable for HSC students. Should you have any questions, we encourage you to contact Mr Vargas, our Technical Support Officer, on 02 9822 1430.